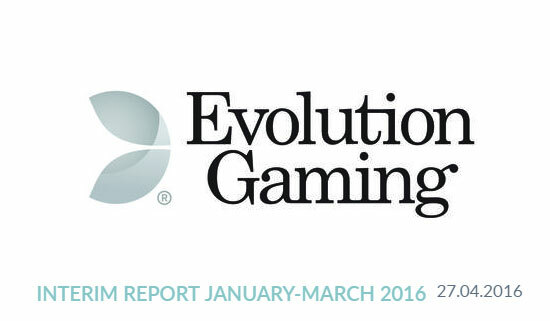 Evolution Gaming have announced strong interim results for the 1st quarter of 2016 January – March. The strong growth of 2015 has continued into 2016 and in the first quarter Evolution’s revenues rose by 59 percent compared with the same quarter last year. EBITDA amounted to EUR 10.3 million, corresponding to a margin of 42%. Mobile growth also continued, with mobile penetration amounting to 34% for the quarter. To date, the year has been characterised by a high level of activity. Among other things, we have entered into a new platform partnership with Aspire Global, and also extended our previous deal with BetConstruct. Platform partnerships are good sales channels and through them we gain a continuous stream of smaller operators who start using our services, and who, over time, can potentially grow into large customers. During the quarter, last year’s strategic agreement with Microgaming also began to produce results, with Betway having now integrated our services fully, including a number of dedicated tables. Additional customers can be expected through this agreement over the year, with 32Red being one in the starting blocks. We also continue to expand existing customers’ offerings. 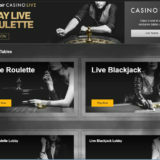 During the quarter, among others, William Hill went live with a new Vegas environment in Riga, while Betsson went live with new dedicated environments in both Riga and Malta. Other customers who have increased their number of dedicated tables are Unibet, Mr. Green, 888 and GVC. The very strong demand for dedicated offerings requires space and we are continuously expanding our studio space in both Riga and Malta. We have also expanded in Belgium with a dedicated environment for Napoleon Games, built on-premise at the customer’s facility in Aalst. On the product side, we have entered an agreement with Scientific Games for an exclusive live version of Ultimate Texas Hold’em to be launched later this year. 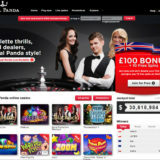 We are also preparing the launch of Double Ball Roulette through the strategic partnership with Games Marketing. Live Baccarat Squeeze, which was launched at the end of last year, is progressing very well, particularly in the VIP segment where many players have greatly increased the amount of game time. 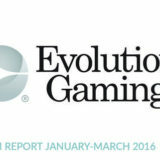 Live Caribbean Stud Poker, which was launched in November last year, is also starting to gain in popularity and many operators integrated the game during the quarter. In addition to the exciting development of the game portfolio, during the quarter, we also began to roll out our new Live Lobby, which will be another manifestation of our ongoing mission to further distance ourselves from the competition. 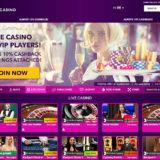 This involves much more than a cosmetic upgrade, among other things, by making it easier for end users to choose their favourite table and dealer. The new function, in which you see live snapshots even before having joined a particular table, enhances credibility and, at the same time, builds confidence in the product. On the whole, I view the continued development of both the market and Evolution with the same confidence as previously. 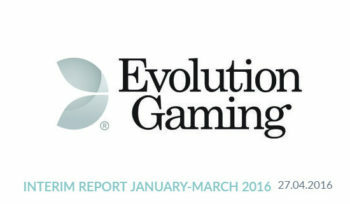 Although Live Casino remains a small part of the total online gaming market, with its social interaction and customisable content, it has what it takes to continuing growing at a high pace over the coming years. At the same time, we will continue working according to our clear strategy to support both existing customers to develop their live offerings, while also benefiting from future growth areas such as land-based casinos.